Starting with Firefox 22 the web browser is now respecting the display scaling of the operating system which may have changed how the browser UI and websites are displayed on user systems. The linked article highlights how you can change the size of fonts in the browser so that they appear larger or smaller on the screen. But what if you have issues with the font size on some websites only? Say sites that use a font that is too small to read. While you can use the browser's zooming feature to zoom in on the text by holding down the Ctrl-key and using the mouse wheel to zoom in or out, it is not really that comfortable of an option if you experience the issue on many sites. An extension like NoSquint may help you as it enables you to adjust text-only and full page zoom levels as well as color settings globally and on a per-site basis. It may be overkill though especially since it is not lite on resource usage. No Small Text is a lightweight add-on for the Firefox web browser that sets a minimum font size for all web contents. What this means is that all websites that you load in the browser use at least this font size to display their contents. Sites that use a larger font setting are not affected by the extension at all, while all sites that use smaller font sizes are. The extension adds a single icon to the browser's main address bar. A click on the icon enables or disables the extension (indicated by the icon turning green or red), while a click on the down arrow next to it displays the font size selection menu that you can use to pick a minimum font size. Changes that you make here are immediately visible on all open websites, provided that they use smaller font sizes than the selected one. You can move the toolbar icon to another location easily. Just press the Alt-key on your keyboard and select View > Toolbars > Customize from the menu. Drag and drop the icon to another location to place it there (for instance the status bar). You wrote “The linked article highlights how you can change the size of fonts in the browser so that they appear larger or smaller on the screen”, but I could not find that article you refer to? Thanks. The first link in the article is the one. 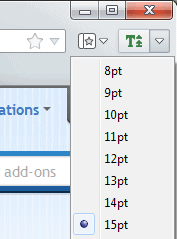 Under Firefox 22, is there a way to just change the font size of the address bar without changing the size of the program Icons? I really appreciate the help using the about:config settings. For me either the address bar font is too large and the program icons are too small. This one thing makes me want to go back to V21. change 15 to a different value until it fits perfectly. That did it! After playing around with the “layout.css.devPixelsPerPx” settings and this one, I have the configuration I wanted. Rather than using yet-another add-on, I have a PrefBar button to enable/disable the use of my own font and font size on sites that are difficult to read. Preference “browser.display.use_document_fonts” is mapped to the checkbox “Allow pages to choose their own fonts” in menu Options/Content/Advanced. FWIW, I install the Firefox add-in Toolbar Buttons (https://addons.mozilla.org/en-US/firefox/addon/toolbar-buttons/?src=ss) which lets the user add a zoom out / zoom in (- +) control to the toolbar. This makes it simple to resize webpages with a click or two. Firefox remembers the zoom settings on a granular basis so you only have to adjust a website once.